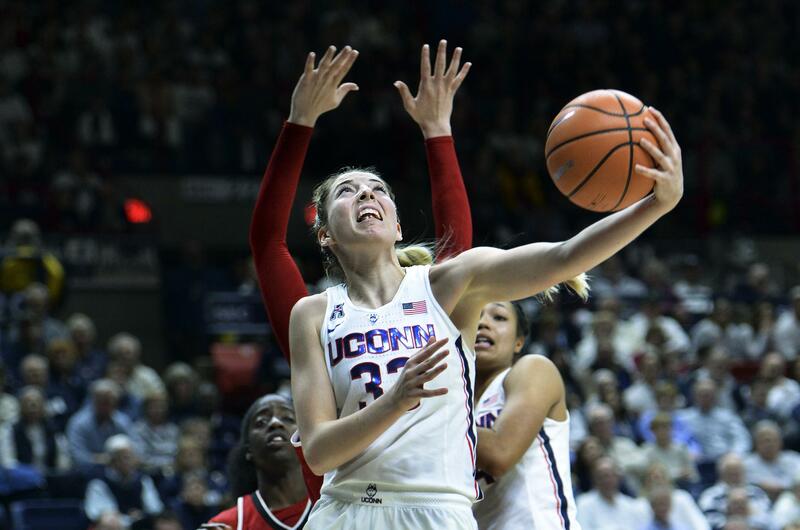 Mon., Feb. 12, 2018, 7:59 p.m.
Katie Lou Samuelson scored 26 points and top-ranked UConn used an early run to beat No. 4 Louisville 69-58 on Monday night in Storrs, Connecticut. Napheesa Collier added 14 points and Gabby Williams had 12 points and 15 rebounds for the Huskies (25-0), who won their 76th consecutive home game and ended Louisville’s 13-game road winning streak. Louisville (25-2) scored the first three points and UConn rattled of 19 straight. Samuelson had seven points during that game-changing burst. By the time Jazmine Jones’ reverse layup went in just before the end of the first quarter, the Cardinals were down 22-6 much to the delight of the sellout crowd of just over 10,000 fans. It didn’t get much better for the Cardinals in the second quarter as they trailed 42-22 at the half. UConn’s star junior had 19 points at the break. (13) Missouri 84, Arkansas 58: Sophie Cunningham scored 18 points with four 3-pointers, Jordan Frericks had 15 points and eight rebounds to lift the Tigers (20-5, 8-4 Southeastern Conference) past the Razorbacks (12-13, 3-9) in Fayetteville, Arkansas. For the first time since 1984-87, Missouri has three straight seasons with 20-plus victories. Jordan Chavis added 12 points off the bench for the Tigers, who shot 51.7 percent from the floor with 11 3-pointers. Hannah Schuchts scored 10. Jailyn Mason scored 15 points and Bailey Zimmerman added 14 for Arkansas, which fell to the Tigers 88-54 on Jan. 21. Published: Feb. 12, 2018, 7:59 p.m.